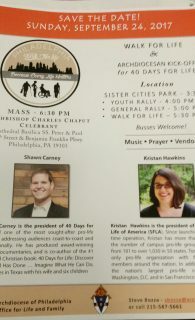 Walk for Life coming to center city Phila. Sunday, September 24, 3:30 p.m.
Sunday, September 24, 8 p.m.
Join the Archdiocese of Philadelphia for the kickoff of the 40 Days for Life Campaign on Sunday, September 24. All pro life club, leaders, and advocates are welcome to attend this event. This year’s speakers are Shawn Carney, Founder of 40 Days for Life Campaign, a life-changing pro-life initiative founded 10 years ago in Bryan, Texas. Also speaking will be Kristan Hawkins, president of Students for Life of America. Her organization is present on more than 10,000 college campuses and helps organize the Walk for Life in San Francisco and March for Life in Washington, DC. Mass will be celebrated by Archbishop Charles Chaput at 6:30 PM in the Cathedral Basilica of SS. Peter and Paul.